Well, here we are in the home stretch of yet another calendar year. Actually, “home stretch” is an apropos phrase, if we are stretching (extending ourselves) for the Lord Jesus and anticipating his “taking us home.” Contrary to popular Christian opinion, this does not mean by murdering us. Home is where the heart is, and our hearts are devoted to The Man who gave his life so that we might live forever. At his appearing, we will be with him, and thus “at home,” first in the heaven of heavens for about seven years, then in the Millennial Kingdom, and finally in God’s everlasting Paradise. And with each passing day we draw closer to that glorious moment! The Living Truth Fellowship is concluding its sixth year of ministry, and as I look back at all that God has done for/with us, my heart overflows with thanksgiving, and I thought I’d share a little of that history with you. 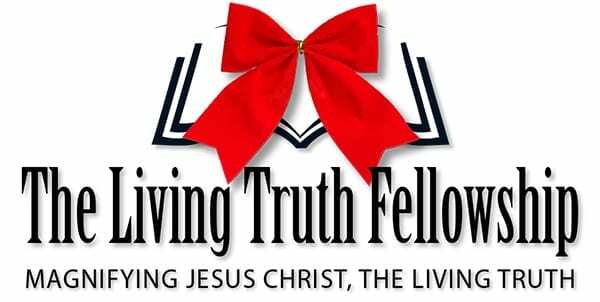 Born out of necessity, if you will, as I sought a platform to teach the Bible, TLTF sprang to life with its January, 2010 incorporation, and I began to assemble a nucleus of servant-leaders who I believed would stand for the truth of God’s Word and do so with genuine humility. An interesting fact is that in early 2010 when we applied for our 501(c)(3) status as a “church,” our lengthy application to the IRS somehow got lost in the pile. I discovered that some months later when I called to inquire about it after receiving no response—and I was aghast when they said they knew nothing about it. But my dear father had been the General Manager of Lilly Endowment, Inc. (then the second largest foundation in the country) from 1961-72, when the mayor of Indianapolis was Richard Lugar. They had become friends, and Dad had kept in touch with him after he became a U.S. Senator. So I immediately called Senator Lugar’s office here in Indianapolis and spoke with the woman who through the years had helped me with a number of things, such as visas for overseas visitors, etc., and within two weeks we received our letter from the IRS granting us church status and the ability to receive tax-deductible gifts. My dear Elizabeth came up with the name FRUIT OF D’VINE, and we sent out our first monthly communiqué in February, 2010. You might find it inspirational to look back at some of those early FODs. From the beginning of TLTF, our goal was to produce a foundational class, and in July, 2011 we filmed One Day With The Creator, along with The End Times, releasing DVDs of the latter in 2012 and the former in 2013. Now available FREE in electronic form with English closed captions, and translated into 163 languages, those two flagship productions have changed the lives of people around the world. We pray they will go viral, at least in terms of reaching every human who wants that depth of biblical truth. In March of 2016, pending my having the required stamina, we plan to film Jesus Christ: The Diameter of the Ages, which we estimate at 20 hours. It will be a terrific addition to our stable of outreach vehicles. We started TLTF “without a dime,” but enough of the brethren whom I initially solicited for support responded to the degree that we could begin to pay Franco Bottley for his world-class graphic arts talent. I didn’t really know Franco like I do now, and, in retrospect, I see how all of us have also benefited from his computer skills, his administrative ability, his heart of service, and his spiritual maturity. Franco remains the only person receiving anything close to a fulltime wage, and for the past few years we have contracted with Shawndra Higgins as our part-time Social Media Coordinator. Last year Bob Wassung came on part time teaching our monthly Research Fellowship and coordinating our Research Committee. Don Chamberlain (Prayer Team Coordinator), Leah Cooper (Online Store Coordinator), and Rosanne Martino (Bookkeeping) do a great job for us as volunteers. You can see more of our history, and our vision for the future, in our updated Strategic Plan 2016. 20 I have no one else like him [Timbo], who will show genuine concern for your welfare. 21 For everyone looks out for their own interests, not those of Jesus Christ. Because we have done our best to stay faithful to teaching the truth in love and dealing with people (and money) honestly, God has blessed us financially to the end that we have on hand the amount we think it will cost to film JCDA, and the amount to significantly upgrade our website (when we can get to it), as well as some extra in reserve. We do have other ideas and projects to spread the Gospel that will cost money, and it is true that I have not yet received a salary (I’m about to retire from teaching SAT Prep after the class next month), but God has amply provided for me as He always has. We have no doubt that if the time comes when TLTF needs to pay me (and others), the money will be there. “Let’s Build Something Together!” That’s the current slogan of a large home building supply store chain, and it is most certainly appropriate for those of us concerned with rebuilding “the wall of Truth” that religious tradition has torn down. Actually, David said essentially the same thing in 1 Chronicles 28 when he assembled the leaders of Israel and told them of the plan to build the Temple, for which they needed money. In Chapter 29:1-9, in what could be considered his farewell speech as the king, David stepped up and set the example by pledging 110 tons of gold and 260 tons of silver. “Okay, folks, that’s a good start to our telethon. Who else will pitch in a little something for the cause?” Then the leaders pledged another 190 tons of gold and 375 tons of silver. Verse 9 says: “The people rejoiced at the willing response of their leaders, for they had given freely and wholeheartedly to the Lord.” That is, until they found out they had to carry the stuff. David’s effusive praise that followed is something each of us would do well to emulate on a daily basis. 10 David praised the Lord in the presence of the whole assembly, saying, “Praise be to you, Yahweh, the God of our father Israel, from everlasting to everlasting. 11 Yours, Yahweh, is the greatness and the power and the glory and the majesty and the splendor, for everything in heaven and earth is yours. Yours, Yahweh, is the kingdom; you are exalted as head over all. 12 Wealth and honor come from you; you are the ruler of all things. In your hands are strength and power to exalt and give strength to all. 13 Now, our God, we give you thanks, and praise your glorious name. Then he declared great truth that is the bedrock attitude each Christian should have in regard to material giving. 14 “But who am I, and who are my people, that we should be able to give as generously as this? Everything comes from you, and we have given you only what comes from your hand.15 We are foreigners and strangers in your sight, as were all our ancestors. Our days on earth are like a shadow, without hope. 16 Yahweh our God, all this abundance that we have provided for building you a temple for your Holy Name comes from your hand, and all of it belongs to you. 17 I know, my God, that you test the heart and are pleased with integrity. All these things I have given willingly and with honest intent. And now I have seen with joy how willingly your people who are here have given to you. As you may know, the biblical principle is that believers are to “give in response to a blessing.” If you have taken advantage of the many resources TLTF has, and if our work is touching your heart and benefiting you, would you please help us with a year-end gift? Whether or not giving TLTF a gift this month will enhance your tax position for 2015, we hope you will prayerfully consider sharing with us as much as you can. By the grace and mercy of our God, this unique ministry is reaching out to more and more hungry souls around the world, and virtually everyone who takes advantage of what we have to offer LOVES it! If you do benefit from our work, and regularly contribute to us, THANK YOU!!! Would you consider increasing your gift, even $5 a week or $10 a month? If you are a new contributor, please don’t think that a small amount doesn’t matter—it does. Of course, all gifts to TLTF, including stock certificates, are tax deductible. The TLTF Finance Committee is made up of Jon Touchstone, Bob Keck, Rosanne Martino, and Greg Rogers. Here’s the link to the Finance Committee Mission Statement, so you can see how diligently we steward the gifts you give us. I recently heard a Bible teacher say that his goal in obeying God is to say: “My answer is ‘YES!’ What’s the question, Heavenly Father?” That reminded me of 2 Corinthians 1:18-20. Because Jesus always said “YES!” to God, all the promises of God are “YES!” to us. Let us walk in obedience and take full advantage of those precious promises in this coming year. I pray that you and yours enjoy the holiday season, thanking God for another year of life and fellowship with Him and His Son. Let us resolve to stand with and for the Lord Jesus even more boldly in 2016, come what may. Thanks for your prayers!